Daniel “Big Kansas” Gallemore wasted no time in capitalizing on an opportunity to end his fight, and in doing so, he retained the Victory Fighting Championship heavyweight title at VFC 57 on Friday night in front of his home-town fans in Topeka, Kansas, and live on UFC FIGHT PASS. 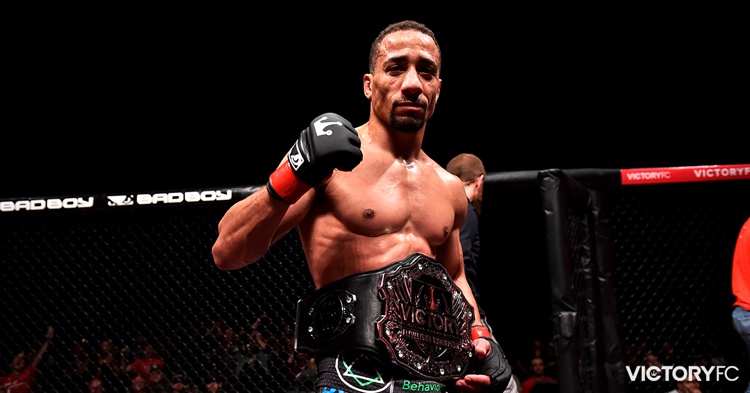 It was also a big night for another Topeka fighter as Kevin “Pocket Herc” Gray seized the moment to secure a stunning win over veteran Nick Mamalis and claim the vacant VFC flyweight championship. Gallemore (7-3) exchanged wild punches with challenger Daniel “The Predator” James in the opening moments of the main event. He was eventually able to back his opponent down as he mauled James (6-3-1) with right hands. In an instant, Gallemore locked down a guillotine choke, ran James from one corner to the other along the VFC square cage fence, and coaxed the tapout at 1:24 of the opening round. The finish was nearly a carbon-copy of the one that Gallemore staged to take the title from Abe Wagner at VFC 50 almost exactly one year ago. “Basically, a replay. Same choke, opposite corner,” said the 31-year-old Gallemore, who made his case for promotion to the UFC. For Gray (8-3), the win took a little longer compared to Gallemore’s tidy stoppage, but it was nonetheless impressive. Gray overcame a strong first-round effort by Mamalis during which the former VFC bantamweight champ thumped Gray hard to the canvas with a body-lock takedown and then went for a submission by rear-naked choke. But Gray bullied Mamalis into a corner in the second, clamped down on a guillotine, and forced the referee to jump in as he rendered Mamalis (28-12) unconscious. “Whoever wants this can come get it,” said Gray of any impending challengers. Gray’s teammate and business partner Darrick Minner also showcased a treacherous guillotine choke as he took out Justin Overton (4-4) just 1:20 into their catchweight (147 lbs.) matchup. In a bantamweight tussle between former friends and training partners, Daron “I Am” McCant (3-0) scored a rear-naked choke submission finish over Sharky Slyter (3-2). McCant took Slyter to the mat, rained down punches from behind his foe before flattening him out and securing the finish at 2:57 of Round 2. Also taking out his opponent in the second round was Trey Ogden, who notched his sixth straight win by knocking off the previously unbeaten Chance Thackston (3-1). Ogden (8-1) executed a well-timed sweep from the bottom and got behind Thackston which led to the submission at the 2:19 mark. Victory Fighting Championship returns on Saturday, July 22 with VFC 58 taking place at the Baxter Arena in Omaha, Nebraska. Canelo vs. Chavez Jr results: Canelo Alvarez easily defeats Julio Cesar Chavez Jr.